After several years of softening our hearts, the Lord lead our family down the path of adopting children with medical needs from China. In 2008, we adopted a dear son who was born with bilateral cleft lip and palate. While in China visiting his orphanage, we immediately knew God was prompting us to return to China to adopt one of the older children who were still in need of a family. In 2009 we prepared for the adoption of a special 5 year old girl from northern China born with hearing and digit issues. Adopting a second child within a year of our first adoption was indeed a stretch of faith and of finances. And the overall expenses of an international adoption from China increased during this year. We took on additional employment, lived very frugally, and hosted several fund-raising events. We felt the need to contact Operation Starfish (now Global Adoptions Foundation) to apply for a grant. It was the sacrificial giving of the body of believers that enabled us to receive a needed grant from Operation Starfish. We were so thankful, excited and humbled by this. 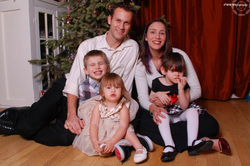 This grant and several personal gifts helped us manage the adoption expenses. Our hearts had a such a passion for the orphan and God has such a faithful plan. In 2011 we were given permission to adopt our daughter’s best friend (then age 6) from the same orphanage in northern China. Her medical need includes scoliosos and a limb issue. In addition, China extended us the blessing of adopting a 4 year old boy who was born with spina bifida. 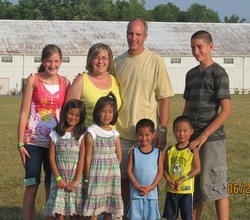 What a stretch of faith to adopt two children in one trip to China. Pursuing four adoptions in three years was worth every sacrifice, but the expenses of the adoptions and of medical care were quite great. We had not anticipated the second adoption, so we were not prepared for that expense. Once again, we lived carefully, took on additional employment and prayed for provision. We did find the need to extend a loan, but we were blessed in many ways with the generosity of others. God faithfully blessed us with the support of Operation Starfish in offsetting a portion of that expense through another grant. How humbled we were by the partnership of our friends in the Lord. And how touching to see the body of believers caring for the needs of the orphans in many different ways. Now a family of six children, we are walking down a path of faith that challenges, and yet satisfies, us every day. We will always be mindful of the giving of others through the work of Operation Starfish. "If fear and money weren't an issue, would you adopt?" To be honest, both were issues for us. However, since we started the process to adopt, we've simply taken one small step after another and here we are now, almost completely to our savings goal and one large step closer to soon meeting our child. When we started the process, we didn't have more than a couple hundred dollars saved in the bank. The doubt of having the resources we needed certainly tried to scare us away from such a costly (but worthwhile) endeavor. But we knew God was calling us to grow our family in this way and so we also knew He'd be the one who would ultimately provide for our every need. Part of how He provided for our adoption expenses was to connect us with Global Adoption Foundation. Shortly after filling out an application, we were told we'd be given a pretty significant grant. Through Global Adoption Foundation and the work that they're doing, we are one step closer to growing our family of three into a family of four! Their mission is to help take some of the monetary burden off of families looking to adopt, and for us, it was a huge encouragement to not only be recipients of such a generous gift, but to be a part of an organization that shares our heart for orphans in our city and around the world. Through financial gifts from family and friends, fundraisers and through the generous grant from Global Adoption Foundation we have seen our fear of not having enough money melt away as we've literally witnessed the generosity of friends and strangers alike as they support us in bringing home our next sweet baby. When we first saw Geri’s profile, she was 2 1/2 years old and almost totally blind. She couldn’t walk or talk. Yet, when we saw videos of her, we thought there was a spark in her eyes that said “I’m still in here, if you’re willing to try to reach me. I haven’t given up yet.” We knew right away that she was our daughter, and that we would do anything for her. Almost a year later we met her, and were stunned to learn that her vision had improved somewhat and she was learning to walk. She still had a lot of ground to cover, but we had hope for the future. A few months after we met her, we returned to bring her home with us. We had no idea what to expect, but we believed with all our hearts that she had a great deal of potential and would blossom with the right circumstances. It’s now been about 15 months that she has been home, and Geri has changed so much. It’s not been easy - there have been a number of surgeries, painful recovery times, unexpected diagnoses, lots of ground gained and then lost and then gained again - but this journey has been incredibly rewarding. She has come so far, and we believe she will continue to improve. When she came home, she was a four-year-old who could not walk, talk, chew, play, stand, or engage with us. Now, she is a bubbly 5-year-old who walks with her long white cane, who loves slides and ladders and swings, who climbs the furniture and chases her siblings and the dogs. Geri counts to three, enjoys books and cuddling, attends preschool, tells stories and plays pretend. She enjoys apples and mangos, chicken nuggets and fish, apple juice and almond milk. She really loves potato chips and will devour the occasional piece of candy, although she’s not a fan of gummy snacks! She has a sweet personality and is deeply affectionate, innately curious, funny, silly, sensitive, kind and a tiny bit stubborn at times. She has brought so much joy into our family! Most of all, she has unbelievable potential and we are excited to watch her true spirit emerge with love, time and resources. She is an absolute blessing to our lives, and we are deeply grateful and honored to have her as our daughter. I want to add that we could not have gotten through the adoption process if the money had not been in place, and part of that was you. Your organization brought this child out of a life of institutional neglect. You truly saved her life, of that I have no doubt.